At the start of this year, I spent a lot of time analysing how I had met my goals for 2011, and setting my goals for this year. One of those new goals was to get my weight below 70kg. A quick look at my bodyweight log shows that my progress at the start of the year was slow but steady… Until April, when my weight jumped back up to 75Kg and it has remained consistently there ever since. It is pretty obvious I need some more motivation to get my weight done. 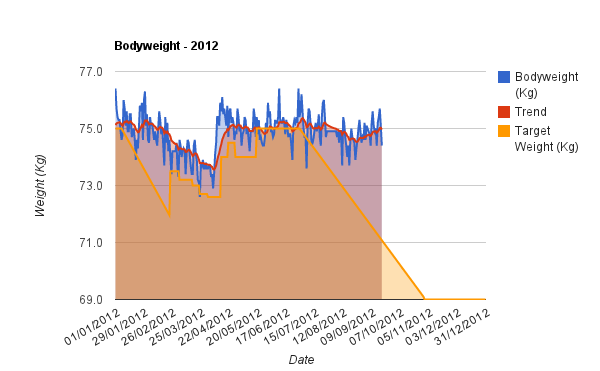 So if I get my weight below 70 kg by 1st December of this year, I’ll be taking a holiday in USA in 2013. If I don’t make the weight, I’ll be spending a wet weekend in Portrush. If that doesn’t motivate me to get into shape, I don’t know what will. You can continue to monitor my bodyweight log, and I’ll let you all at the end of the year whether I’ve achieved my weight goal.